Increase the RPM limit of your Norton and reduce the danger of valve float with JS Motorsport Radius Cam and Lightweight Lifter kits. I have personally tested these components beyond 8000RPM. Some short stroke racers have revved smooth ramp cams with beehive springs to 9000. JS Motorsport Radius Cams are superior to standard flat lifter cams in all respects. The 1-1/8″ radius lifters allow the use of a broader cam nose (similar to a roller cam) to reduce stress and wear. See the broader nose of the JS cam on right (pointy stock nose on left). The durability and long life of our cams and lifters will save you money in the long run. This technology was initially developed years ago when factory sponsored Nortons were winning US dirt track races. We have refined this development to reproduce the pinnacle of performance for our vintage super bikes, for both street and track. JS0 - The perfect cam for stock street Nortons and stock broad power band performance with a slight overall improvement, stock springs OK. Smooth idle with good low end torque. BSA A65 Spitfire intake lobe profile on intake and exhaust. .345" .390" 268° 104 Close to Stock Norton Commando cam but with slightly more lift and duration. 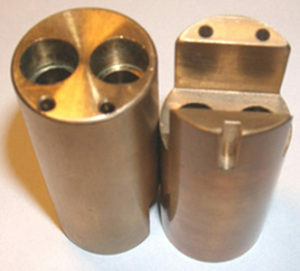 For 1-1/8" radiused lifters. 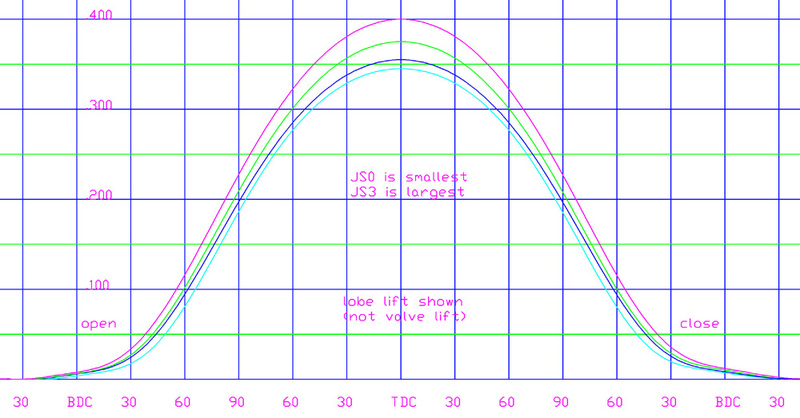 JS1 - hot street and all around racing for 4 or 5 speeds with strong mid range. Good idle but faster than stock. Requires racing springs for track. Great for 750s. This is a copy of the famous Axtell #3 cam but for lightweight radiused lifters. Note that Ron Wood achieved 84 hp with an Axtlell #3 cam in his 750 flat tracker. .352" .398" 278° 104 Copy of Axtell #3 but for 1-1/8" radiused lifter. Performance similar to Megacycle 560NR and 560-00. Will fit 750 cases. JS2 - full race PW3 copy for radiused lifters with excellent mid & Hi RPM power for all racers with 5 speeds and hot street 850s & 920s. Best all around roadrace cam. Requires racing springs. Hot rod idle. Maria Costello won Daytona 2011 in 750 vintage class with this cam & beehive valve spring kit. JS smooth ramps are good for 9000 RPM with JS beehive springs. .375" .424" 282° 105 Similar to the great PW3 but for 1-1/8" radiused lifters. Improved with gradual ramps to eliminate valve bounce, prolong life and allow higher RPM (more info). Performance similar to Norton 4S, Steve Maney cam. 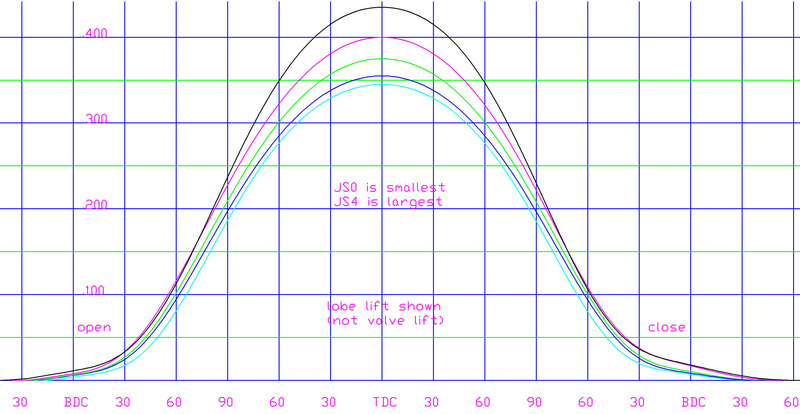 JS3 - for 5 speed all out racers, D+/Sifton 460 grind. Rumpity idle. Requires racing springs. Used on factory sponsored Hi power US dirt track 750 short strokes. JS smooth ramps are good for 9000 RPM with JS beehive springs. Top end race cam. For stage 3 the lifters must be ground to 7/8" radius. .400" .452" 292° 106 Similar to D+ (Sifton 460) and 7S but for 7/8" radiused lifters. Improved with gradual ramps to eliminate valve bounce, prolong life and allow higher RPM (more info). Good for maximum top end power. JS4 - for 5 speed extreme racing and land speed bikes, Sifton 480 grind. Requires racing springs. JS smooth ramps. Absolute monster of all Norton cams. For stage 4 the lifters must be ground to 7/8" radius. Tappet blocks need accurate location for high lift. .435" .492" 292° 106 Similar to Sifton 480. For 7/8" radiused lifters. Improved with gradual ramps to eliminate valve bounce, prolong life and allow higher RPM (more info). Good for maximum top end power. Weighing approx 1/2 as much as original Norton flat lifters, JS Motorsport radiused lifters make your Norton more free reving while reducing stress, friction, wear and overheating of the valve train. 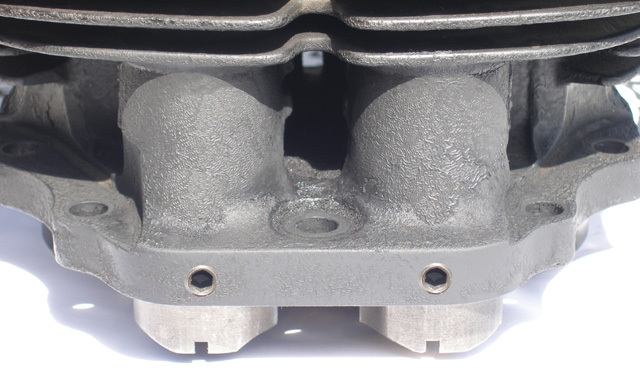 Reducing the weight enables your valve train to operate more accurately and efficiently. Pushrod and rocker arm flex is minimized – giving you the full lift your cam was designed to deliver. This allows you to use more aggressive profiles than would normally be available on cams designed for heavy inefficient stock Norton lifters. 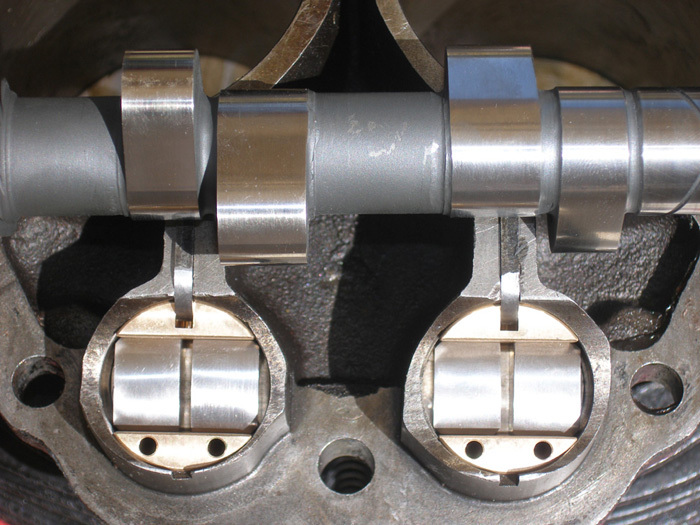 Note that the oil holes in the tappet blocks drain oil directly onto the cam lobes as they rotate toward the tappets for ideal lubrication. Expect greater reliability and longer service. Energy saved on the valve train goes to the rear wheel and wil increase power over the entire RPM range, making your motor behave as if it had an overhead cam. 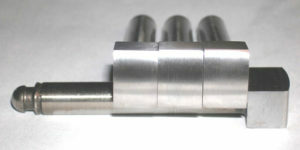 JS Motorsport Radius Cam and Lifters require approximately 3/8″ shorter pushrods than stock. Our pushrods are made of high strength aircraft quality aluminum to reduce flexing and are superior in strength and slightly lighter than stock push rods. They are equal in buckling strength to steel pushrods of the same weight. We do not recommend steel pushrods because hot, aluminum cylinders will expand at a different rate than steel, causing the valve tappet clearance to increase dramatically. Complete instructions are provided with each cam kit. The only modification you must make is to drill and tap the cylinder base flange for the provided set screws as in the photo below. Aluminum or cast iron cylinders work equally well with the set screws. You must use radiused lifters with our radiused cams. Stock flat lifters will tangle the valves. Conversely, if you use radiused lifters on a cam designed for flat lifters you will lose duration and power. Stage 0, 1 & 2 cams come with 1-1/8″ radius lifters as standard. For stage 3 & 4 cams the lifters are specially ground to 7/8″ radius. Early 750s with left front case breathers require hollow cams. Custom cams are available for 270 deg cranks at extra cost. JS cams either have hardwelded lobes or they are made with plasma nitrided billet steel. Either way – these are the highest quality, longest lasting cams you can buy.